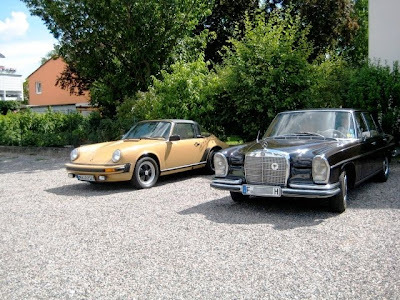 The Motorialist: "Odd Couple" ... Porsche 911 Targa (1981), MB 250 SE (1966) , Thanks to Jo! "Odd Couple" ... Porsche 911 Targa (1981), MB 250 SE (1966) , Thanks to Jo! This Porsche is marvellous! And what an apt contrast to this black Merc ... love it!